(New York, October 29, 2015) – Iran should stop preventing women and girls from attending volleyball matches and take further steps to promote gender equality, Human Rights Watch said today, opening a digital advocacy campaign to promote respect for women’s rights in the country. The campaign coincides with the International Volleyball Federation (FIVB) Men’s Club World Championship in Brazil, from October 27 to November 1, 2015, and an impending decision about whether to allow Iran to host the 2016 FIVB beach volleyball tournament. Volleyball is a widely popular sport in Iran and a great source of national pride. Among the longstanding, serious rights abuses and discrimination women face in Iran, they are barred from entering sport stadiums, including to watch men’s volleyball matches. Iranian authorities’ restrictions on women attending sporting events is part and parcel of a larger pattern of discrimination and human rights violations in the country on the basis of gender. As Human Rights Watch has documented, women in Iran confront myriad abuses, including discrimination in personal status laws such as marriage, divorce, and child custody; the unlawful detention of human rights defenders who peacefully advocate women’s rights; and even restrictions on travel. The authorities recently prohibited Niloufar Ardalan, an Iranian women’s national soccer team captain, from participating in the Women’s Futsal Championship in Malaysia after her husband refused to give his permission for her to travel. The campaign, #Watch4Women, seeks a commitment from the FIVB to exclude Iran from hosting volleyball tournaments until the country ends its discriminatory ban on female spectators. The FIVB has failed to penalize Iran or publicly speak out against the ban, which violates the “Fourth Fundamental Principle” – on nondiscrimination – of the FIVB’s own constitution. 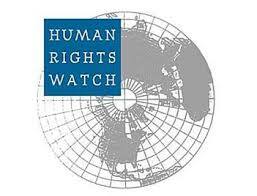 The campaign will include regular updates and actions on the Human Rights Watch Facebook and Twitter feeds. Iran’s discriminatory practices were on full display in June, when it hosted international volleyball matches against Russia and the United States at the Azadi Sports Complex in Tehran as part of the FIVB’s 2015 World League. Officials systematically prevented Iranian women from entering the 12,000-seat stadium to watch the men’s matches. This male-only policy for spectators at men’s volleyball matches dates to 2012, when the Sports and Youth Affairs Ministry expanded the existing ban on Iranian women at men’s soccer matches to cover volleyball. Iranian officials claim that mixed attendance at sports events is “un-Islamic,” threatens public order, and exposes women to crude behavior by male fans. October 2015 Report of the Special Rapporteur on the situation of human rights in the Islamic Republic of Iran to the seventieth session of the General Assembly. Islamic Regime in Iran Is Planning To Execute Shahram Ahmadi A Kurdish Minority From The City Of Sanandaj …. IRAN WATCH CANADA: Cry my country, cry for all these injustices. According to news Islamic Regime in Iran is planning to execute Shahram Ahmadi a kurdish minority from the city of Sanandaj. Shahram Ahmadi was coming back from his Sunni mosque to home at night in June 2009 ,when security agents fired at him without warning as a result he was wounded from behind and his nose was also broken and was taken to the hospital where the doctors removed one of his kidney and part of his intestines. After spending 43 months in solitary confinement and torture in Sanandaj and Zanjan prison, he was taken to a court where judge Mohammad Moghiseh in a five minutes court procedure sentenced him to death. This is happening while three years ago regime have executed his younger brother Bahram Ahmadi together with several others including Hamed Ahmadi . 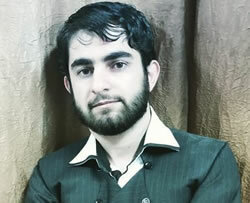 Shahram Ahmadi is currently in "Rejaei Shahr -Karaj " prison . Two years ago his sister and mother after visiting him and returning home had a very bad accident and received brain injuries where they lost their memories . Shahrams Mother is currently paralyzed after the death of her younger son and the news of death sentence of her elder son Shahram. Siamak Namazi The Manager Of Crescent International Is Detained in By Islamic Regime in Iran ! According to news, Mr. Siamak Namazi the program manager of oil company Crescent International is being arrested and detained in Iran and have been in prison since two weeks ago. The officials in Iran rejected Mr. Namazi's arrest and detention . Mr. Namazi have a company called " Atieh Bahar " which provides consultation about oil to international companies. More The 20 Prominent Iranian Musician Are Banned To work ,Because , They Had Interviews with Radio Javan …. According to news , regime has banned more than 20 prominent musician from working because of speaking or working with Radio Javan . After publication of this news , Mr. Farzad Talebi the head of music division in the Ministry of Culture & Guidance said: Radio Javan runs by US and therefore presence of these musician in this radio or cooperation is illegal. Some of these musician are banned between six to a year from working. 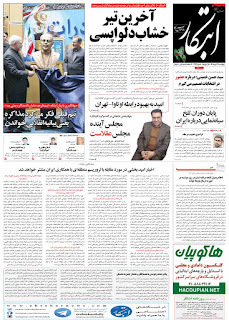 IRAN WATCH CANADA: Freedom under Islamic regime with or without Hassan Rohani means ……………??????????????????? According to news, Morteza Nematolahi who is serving as manager of the office for Ayatollah Seyed Sadeq Shirazi ( a source of imitation for religious practice by Shiite Muslim around the world ) is arrested and detained . Clergy Morteza Nematolahi was summoned on last Sunday by the court of revolution (Regime's clergy Court ) and since then no one knows on his whereabout. 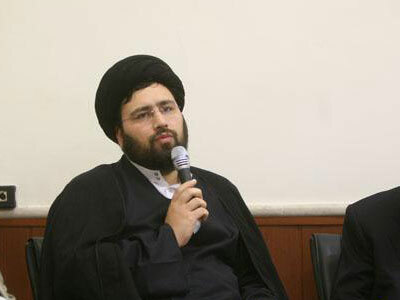 Ayatollah Seyed Sadeq Shirazi is a critic of the Islamic regime in Iran. Last week Seyed Hosein Shirazi the son of Ayatolah Shirazi was also summoned by clergy court and was told not to criticize the regime during the holy month of " Moharam " ( a shiite mourning month for the killing of the family members of Imam Ali ). Among 91 Developing countries In The World Iran Ranks Number One on Migration of young People With High IQ ! According to a report by ISNA today, Mr. Mohammad Hossein Kafrashi an official in the Ministry of Education spoke about the high number on the migration of young Iranian with high IQ to abroad. Annually 150,000 young Iranian with high IQ leave the country and that means 50 Billion Dollars lost in revenue. 60% of Iranian population is under 30 years of age. 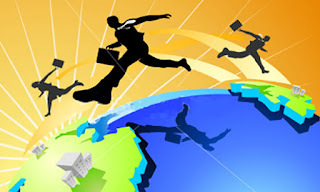 The World Bank believe that the reason for migration is because of unemployment of young Iranian . 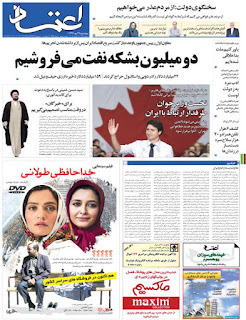 Islamic Regime in Iran Blocked " Telegram " Application because Of Not Cooperating With Regime On Spying Over Iranian People ..
Reformists Newspapers in Iran Wrote About The Federal Election in Canada …..
With the defeat of Harper , Justin Treaudu the leader of the Liberal Party has become the Prime Minister of Canada. The paper indicated that , Justin Treaudu during his campaign has promised for the improvement in diplomatic relation with countries . The paper also mentioned about the two Iranian liberal candidate Majid Jouhary and Ali Ehsasi who have successfully won in their electoral jurisdiction in Toronto Area and will go to the federal parliament . Both Iranian Liberal elected candidate believe that, by keeping in mind the human rights issues, relation with Iran must be improved. 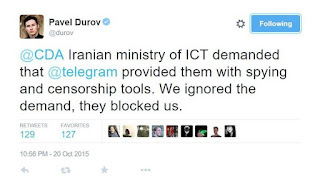 Did Regime Filtered The " Telegram " Application ? According to a report by ISNA news website , The Telegram Application has been filtered by regimes communication ministry .
" 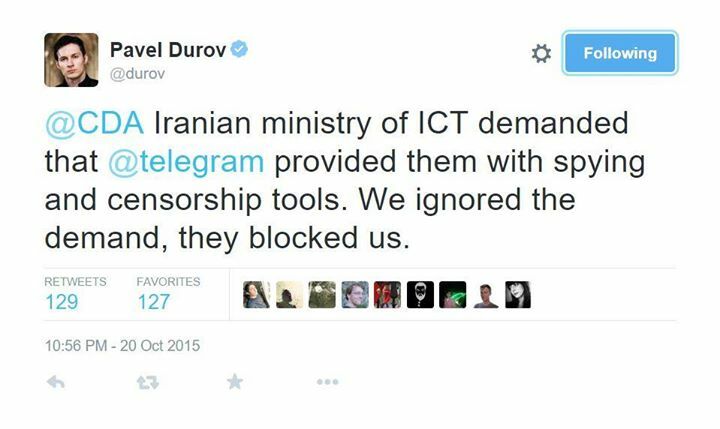 Telegram " Application managers believe that, this application is filtered by the regime in Iran . But despite of the news release by telegram application managers, the regime communication ministry says that, they haven't received any order to filter the application. it seems that the application has been filtered again by regime to control and censor the free flow of information among millions of young Iranian. The Saudi Arabian authorities today continued their cynical use of a repressive and overly vague counter-terrorism law to purge the Kingdom’s small and embattled civil society by convicting the human rights defender Abdulkareem al-Khoder and imprisoning him for 10 years, Amnesty International said. 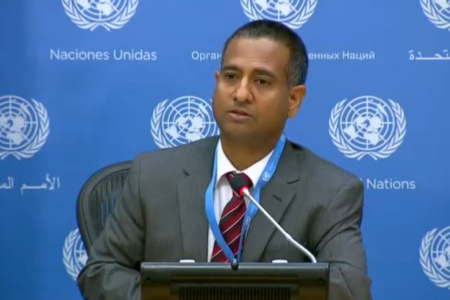 The Secretary-General is deeply saddened by the news of the execution of two juvenile offenders last week in Iran. The International Covenant on Civil and Political Rights and the Convention on the Rights of the Child -- both ratified by Iran -- prohibit s the imposition of the death penalty for crimes committed by persons below eighteen years of age. The Secretary-General is concerned that these two executions reflect a worrying trend in Iran. Over 700 executions are reported to have taken place so far this year, including at least 40 public, marking the highest total recorded in the past 12 years. The majority of executions were imposed for drug-related offences -- crimes that do not meet the threshold of the “most serious crimes” as required by international law. The Secretary-General reaffirms the opposition of the United Nations to the imposition of the death penalty, and calls on the Government of Iran to establish a moratorium on executions with a view to abolishing the death penalty. 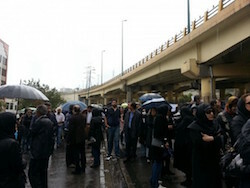 Followers Of Mohammad Ali Taheri Gathered In Front Of Evin Prison And Protested Against The Death Sentence ….. According to Saham News Reporter at least 300 followers of Mohammad Ali Taheri Gathered under the rain in front of the Evin prison and demanded the death sentence against Mohammad Ali Taheri be removed/ withdrawn . Mohammad Ali Taheri the leader of the " Erfane Halgheh " the circle of mystic " has been on hunger strike for more than two months . The followers of Mr. Taheri were handing white flowers to the guards and sometimes were faced the harsh reaction by the prison guards and officials and were forced to disperse and tore the pictures the protesters were holding. under torture. We, the undersigned, ask you to seek justice for Zahra Kazemi. self-incriminating confessions that are obtained under torture. The Grand Son Of Ayatollah Khomini The Founder Of The Islamic Regime In Iran : I Announce That The Iranian People Are 100 % dissatisfied and Angry From This Situation ….
" People are discontent from the economic situation and unemployment and it does not need statistic to know this , i announce that people are 100 % dissatisfied and angry from this situation . The people are angry and dissatisfied from the corruptions of up to thousands of billion Tuman ( Iranian currency ) . In the past no one could move 1000 Tuman from one location to another but now we have reached to a time that a thousands billion Tuman is not a big number ……..
(Beirut, October 16, 2015) – Iran’s judiciary should vacate the conviction of the Washington Post reporter Jason Rezaian after an unfair trial, Human Rights Watch said today. During the trial, the authorities prevented him and his lawyer from freely communicating and adequately preparing his defense. A judiciary spokesman announced Rezaian’s conviction on October 11, 2015. Court authorities have refused to provide clarification to his family or lawyer about the specific charges for which he was convicted or his sentence. He has 20 days to appeal the decision. A branch of Tehran’s Revolutionary Court sentenced Rezaian following four closed-door hearings. Leila Ahsan, Rezaian’s lawyer, presented her main defense during the fourth and final session, on August 10. As during previous trial sessions, Judge Abolqasem Salavati denied Rezaian’s family and journalists access to the courtroom. Authorities have held Rezaian, a dual Iranian and United States national, in Evin prison since July 2014 and denied him access to a lawyer for months before charging him with national security crimes that can carry a maximum sentence of 20 years. Iranian authorities refused for several months to reveal where they were holding the four or to disclose the basis for their detention. In addition to preventing access to legal counsel, authorities also prevented Swiss consular officials, who represent US interests in Iran, from visiting Rezaian in detention to ascertain his well-being since he is also a US citizen. Authorities released Salehi and the two other detainees on bail in October 2014, but pressured the families not to speak to the media or publicize the circumstances of Rezaian’s detention. A source familiar with his case told Human Rights Watch that on November 18, 2014, authorities informed Rezaian that investigations against him were ongoing and extended his pretrial detention. The source said that despite Rezaian’s inability to read or write Persian, authorities did not provide him with an official translator during his interrogation. Under Iran’s criminal procedure code in effect when authorities arrested Rezaian, authorities could hold a suspect indefinitely and deny him access to counsel. Ahsan, Rezaian’s lawyer, said that she was able to meet her client for the first time on April 20, 2015, after she took on his case in early March. Iran’s new criminal procedure code, which went into effect in June, allows defendants to meet with their lawyers. However, various categories of crimes listed in article 302 of the code, which include those charged with national security crimes, must choose their lawyers from a list approved by the judiciary. The United Nations Basic Principles on the Role of Lawyers say that anyone detained by state authorities should have prompt access to a lawyer, no more than 48 hours from the time of detention. As of April 2015, Iran had one of the largest numbers in the world of journalists and social media activists in prison, with at least 46 behind bars, according to Reporters Without Borders. GENEVA (16 October 2015) – United Nations human rights experts today expressed their outrage and profound sadness at the execution of Fatemeh Salbehi, a juvenile offender convicted for the death of her husband, whom she had been forced to marry at the age of 16. Ms. Salbehi was hanged on Tuesday 13 October in breach of international law banning juvenile executions, and despite reported flaws in her trial and appeal process. She is the 11th woman to be executed so far this year in Iran, where at least 700 other people have been executed. A week earlier, another juvenile offender was executed in secret in Iran: Samad Zahabi. No notice was provided to Mr. Zahabi’s family, nor was the required 48 hour notice provided to his lawyer. He was sentenced to death in March 2013 for the killing of a fellow shepherd, when he was only seventeen years old. The UN Special Rapporteur on summary executions, Cristof Heyns, stated “Let us be clear – these are unlawful killings committed by the State, the equivalent of murders performed by individuals. These are profound tragedies that demean the value of human life and sully the reputation of the country.” He added that “executing a juvenile offender, especially after a questionable trial, directly contravenes the International Covenant on Civil and Political Rights and the Convention on the Rights of the Child, to which Iran is a party. Iran must immediately stop killing children”. While highlighting Ms. Salbehi’s young age at the times of her marriages and her lack of consent, Ms. Šimonoviæ expressed concern for the high numbers of early and forced marriages in Iran. 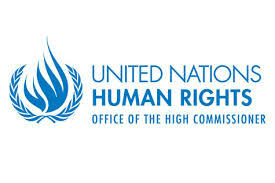 The UN human rights experts strongly urged the Iranian Government to immediately establish a moratorium on executions with a view to abolishing the death penalty. “The death penalty is a cruel, inhuman and degrading punishment and there is no convincing evidence that it is a particular deterrent against crime. Its use to punish someone for a crime they allegedly committed when they were under 18 years old is a flagrant violation of international law,” said James Lynch, Deputy Director of the Middle East and North Africa Programme at Amnesty International. Ali al-Nimr was arrested in February 2012, when he was 17 years old, and held in a juvenile rehabilitation centre and then an adult prison. He was sentenced to death in May 2014 by the Specialized Criminal Court (SCC) in Jeddah, a security and counter-terrorism court, for 12 offences that included taking part in anti-government protests, attacking security forces, possessing a machine-gun and carrying out an armed robbery. Ali al-Nimr has said that his “confessions” were extracted under torture but the court has refused to order an investigation into his allegations. Dawood Hussein al-Marhoon and Abdullah Hasan al-Zaher were arrested on 22 May and 3 March 2012, when they were aged 17 and 16 respectively. They were sentenced to death by the SCC in Riyadh in October 2014 on similar charges, which included taking part in anti-government protests, carrying out an armed robbery, and “participating in killing of police officers by making and using Molotov cocktails to attack them.” They too claimed to have been tortured and forced to “confess”. “Saudi Arabia’s record when it comes to sentencing people to death after deeply flawed legal proceedings is utterly shameful. The death penalty is often arbitrarily applied after blatantly unfair trials,” said James Lynch. Saudi Arabia is one of the most prolific executioners in the world. The kingdom has executed 137 people so far this year, compared to 90 in the whole of 2014. 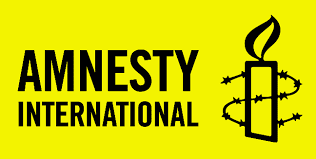 Death sentences are often imposed after unfair trials, with juvenile offenders and people with mental disabilities not spared, Amnesty International documented in a recent report. Since 2012, the Saudi Arabian authorities have been persecuting human rights defenders and dissidents with complete impunity, using both the courts and extrajudicial means such as the imposition of arbitrary travel bans. In February 2014, the authorities put into force a new counter-terror law that has since then been used against human rights defenders and activists to sentence them to long prison terms and even to death. Most trials of these activists have taken place at the SCC, whose jurisdiction is vague and proceedings shrouded in secrecy. In addition to the above Shi’a activists, the SCC had also sentenced human rights defender and lawyer Waleed Abu al-Khair under the new counter-terror law. It also recently sentenced Abdulrahman al-Hamed, one of the founding members of the independent human rights organizations, the Saudi Civil and Political Rights Association (ACPRA), to nine years in prison on 13 October.